Product packaging and inserts are so important. But with so many things to think about as an Amazon FBA or private label seller, it can often be pushed to the back of our minds. I want to introduce Erick Rodriguez, who is going to be sharing his best practice and top tips for Amazon sellers. I was really impressed with Erick’s entrepreneurial mindset. As a recent college graduate he leaped straight into launching his own business. Due to his expertise in this product photography & design, he is well equipped to give us some top tips. P.S. speaking of College, did you know we are now running a Scholarship Initiative for American Scholars? You can find out more about it here, and support it by buying a JS T-Shirt on Amazon. Many Amazon sellers may not realize the benefit of investing in high-quality product packaging and product inserts. But in this article, we’ll cover the numerous benefits, which will result in more sales, happy customers, and fewer in-authenticity claims. Particularly since the big TOS change of 2016, there are some key elements here that should get your attention. Product reviews! But, there’s much more to it than this. To name a few of the best benefits of brand registry, once you register your private label brand via Amazon, you will be able to prevent others from modifying your listing. As there is no competition, you will always have the buy box. 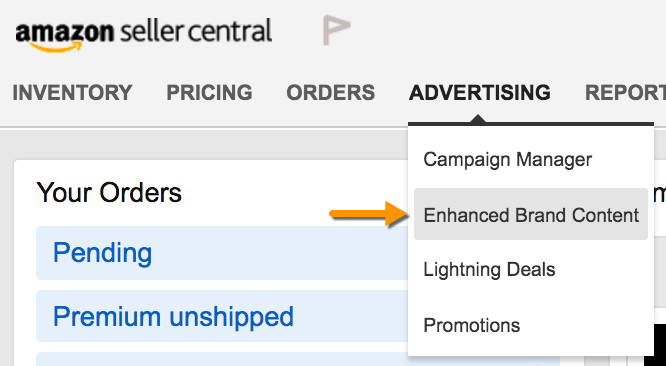 You will also be able to create “Enhanced Brand Listings”. It’s a new feature that recently opened up. which is only available to sellers who have registered their brands via Amazon. Jungle Scout recently posted an in-depth post about how to set it up which you can read here. Once you have a brand registry, you can essentially upgrade your product description, insert enhanced images into your description, which in the past was only open to Amazon Vendors with A+ listings (a similar program that Amazon reported increased sales anywhere from 3 to 10 percent). So with all things considered, this is something that can reduce risk and increase sales. 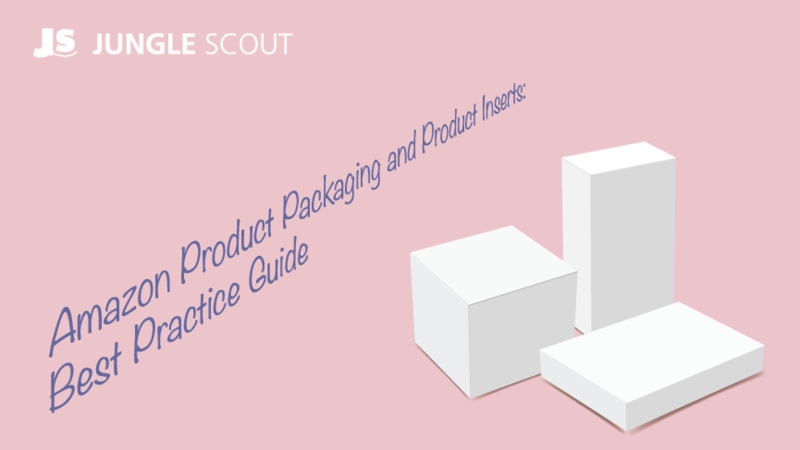 Why product packaging is important in obtaining brand registry? To obtain brand registry, one of the criteria is that you must provide Amazon an image of the product packaging with branding visible. Sorry, folks, that means you can’t get away with just inserting your product into cheap and generic clear poly bags and “slapping on” your Amazon ASIN, which I’m aware is a popular habit with some private label sellers. This saves time and costs, but also does not bring any of the benefits of having awesome packaging. This means you need to have good design and photography, and for many sellers, it means taking this task away from their manufacturers and getting professionals in those fields to do it instead. 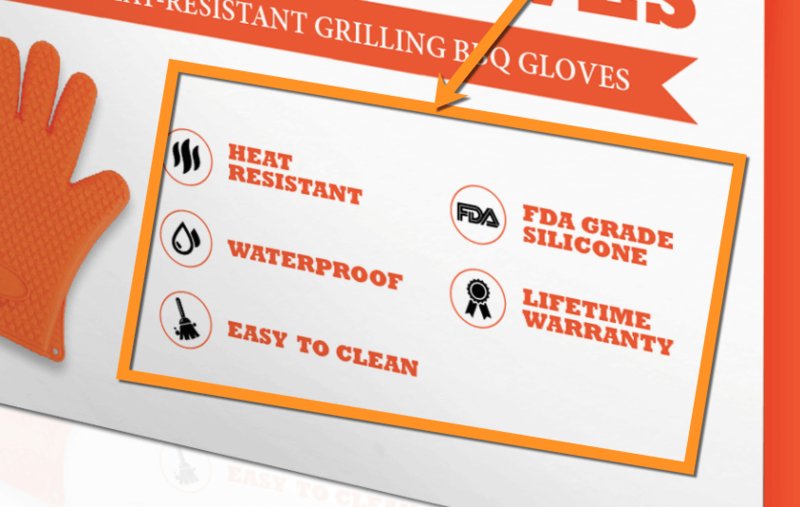 Take notice of the packaging for a pair of barbecue silicone gloves. 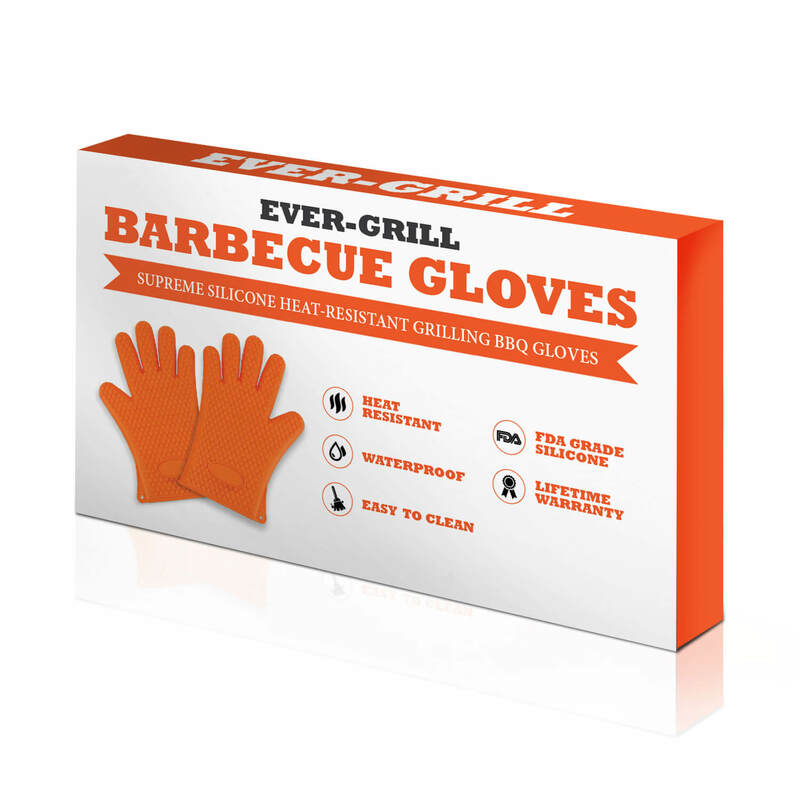 The brand Ever-Grill is displayed in a prominent position at the top of the packaging and then right below it “Barbecue Gloves” is printed. Why is this important? Because it’s essential to communicate as quickly and clearly as possible what your product does. If a customer sees your main image and is unsure if that is the product they are looking for, they will move on and buy your competitor’s product. Next, another clever strategy to use in product packaging it to list the biggest differentiators of your product in a concise and prominent position at the front of the packaging. We’ll discuss in more depth later in the article the purpose of this. But by properly utilizing the above strategy in your listing’s main image, you will see an uplift in sales. An example can be best illustrated by making you think back to your last visit to a retail store. Picture this: you are in the supermarket aisle looking for a certain product you need. Staring at the shelf, you see 10 or more products, all essentially meeting your requirements. What product usually ends up getting purchased? Well, chances are, it’s all about packaging and its eye-catching design. The product with the visually appealing packaging gives off the impression of high-quality. It plays a big part in the decision making process. 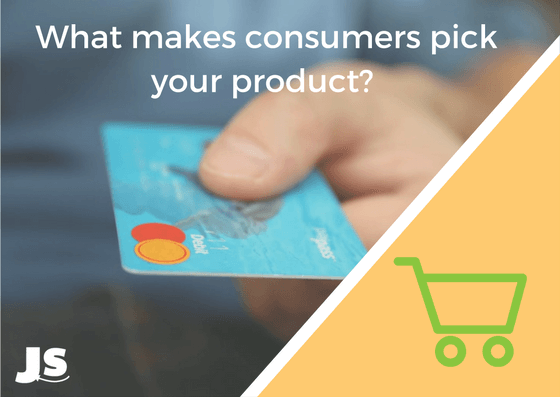 There’s a big chance that product gets picked and often purchased by consumers. So now back to Amazon. When you are deciding on how to design your product packaging you need to spend time looking at the search results page for the primary keywords you’re wishing to target in your listing. 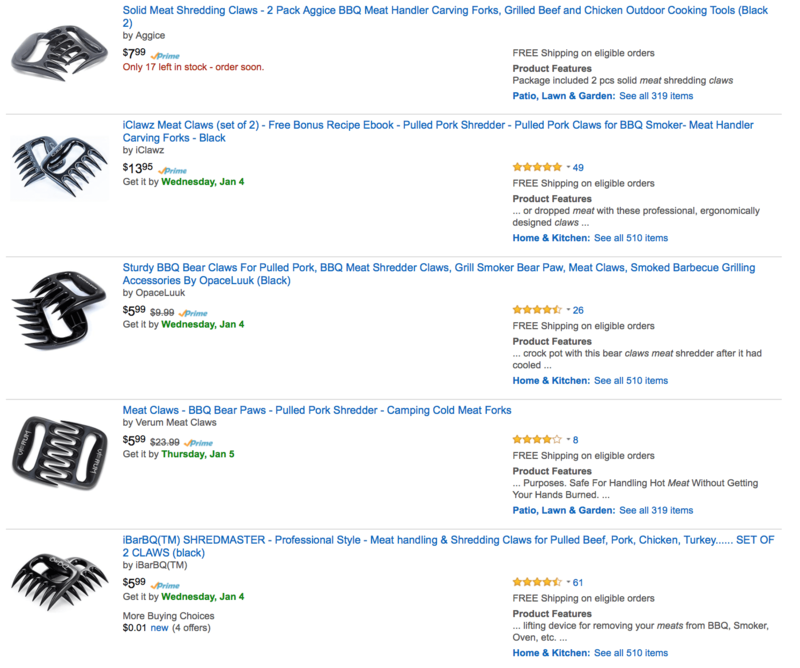 So go ahead and take a moment to search on Amazon.com using broad and generic keywords your product idea. What do you notice? Which colors are all the competitors using? What colors would stand out the most which no one is using? By making an extensive inquiry into these matters, you gain an edge over the competition. Take a look at the below example. Let’s say we were interested in selling ‘Meat Shredding Claws”. We’ll start by doing an Amazon search to analyze what the existing competitors are all doing, since it will make your job of selling your product so much easier. After careful analysis of the search results, you’ll notice that all the options for bear claws are black and bearing the same shape. Track your competitors by using the product tracker in the Jungle Scout Web App. Now take a look at the product image below. Not only did the Amazon seller change the color of the product to red to stand better out in search results but they also designed a clean packaging with the main words “Meat Claws” in prominently large print at the front of the packaging. Also, the seller included it in the main photo. This technique is focused on making the main image conspicuous and the product label stand out. In the end, this method is designed to draw more attention to your product and away from the competition. 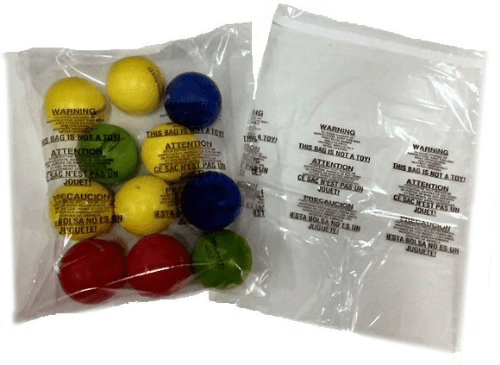 As we briefly mentioned above, a common bad habit of some Amazon sellers is to toss their private labeled product into clear poly bags and to simply ‘slap’ a suffocation label and an Amazon barcode on the exterior and call it a day. However, as everyone knows, one easy way to grow your business without having to invest in more SKUs is to expand the number of sales channels you’re on. Which, might I mention will also increase the valuation of your business should you ever wish to sell it in the near future. 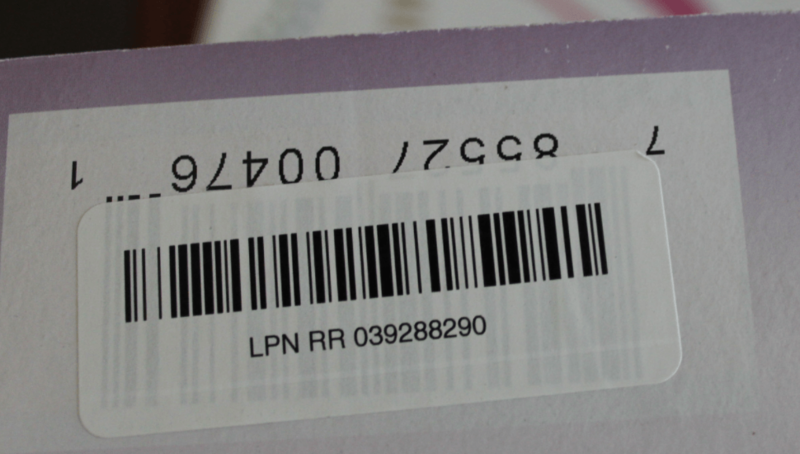 But when expanding to new sales channels, an Amazon barcode will not do, and a sticker UPC slapped on some packaging will look unprofessional. So when creating your custom packaging have your UPC printed on the back of the box, and for any units being sent to Amazon directly print the Amazon barcode as adhesive labels and place it over the UPC. Unlike common belief among Amazon sellers, most Amazon customers mistakenly believe they’re buying from Amazon itself, not realizing that the majority of the time there’s a small business owner behind the sale. As a result, Amazon customers have high expectations for quality. They expect products they buy on Amazon to arrive in a similar high-quality standard as a retail purchase. So if you’re like some Amazon sellers, and you don’t invest in the packaging your product is being delivered in, it may lead to some adverse outcomes. At the very least, your product reviews will be impacted. Thus your average star rating will be lower than what it could have been if you had higher quality packaging. A more subtle effect will be you will be ‘short handing’ yourself. The number of sales you could have gotten if you had a higher average star rating on your reviews. What is likely to happen long-term is that you’re significantly increasing your statistical chances of receiving an in-authenticity claim. Which, if you’ve never received one before is good, you don’t want these. Too many of these can result in a suspended Amazon account! Put yourself in the shoes of a client. One purchase comes in a poly bag. Another product comes in a cleanly designed product packaging. Or with the signature of the Co-Founder printed on the inside of packaging thanking the customer for giving their product a chance. Which version do you think has a higher customer experience? The latter. Take a look at the below for an example of excellent product packaging. 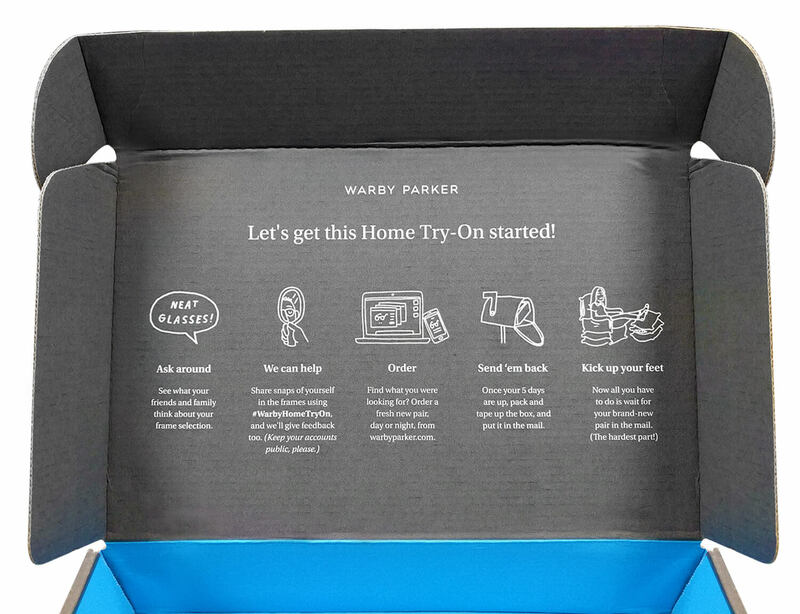 Warby Parker is a prime example of a strong customer experience, as soon as you see the packaging anticipation and excitement is created through the phrase “Good things await you” with the inside flap showing the product instructions. Product inserts are given a ‘bad rep,’ because Amazon sellers will partake in bad habits, pushing the lines of Amazon terms of service when using them. Common bad habits include directing them to your 3rd party website, or incentivizing them to leave reviews. So what are the allowed and highly beneficial ways to use product inserts? They remind the customer of why they bought this product, providing a friendly reminder how these gloves uniquely have 5 main differentiators. This will serve in decreasing return rates, by reducing buyer’s remorse. Another clever thing this Amazon seller did was to ask the customer about their satisfaction level with the purchase, while offering assistance with any issues that they may have. By utilizing this method, they can step in and solve any possible problems the customer may have PRIOR to the customer expressing their dissatisfaction through a negative product review, which will likely result in a negative impact on your product listing conversation rate and overall a negative impact on sales. This works in a similar way to sending out automated email campaigns to customers using software such as Jump Send. Another strategy to use with product inserts when you have a product with a low defect rate is to simply go from the stance of reminding the customer to leave a product review. This will increase your feedback rate compared to solely using an email follow-up sequence. The outcome of strategically made packaging and inserts is a higher click through rate, a differentiator compared to competitors, increasing perceived product value & overall customer experience, higher rate of positive product reviews, and overall increased sales. Erick Rodriguez is the CEO of Virtuous Graphics – Your one stop shop for product photography & graphic design for serious Amazon Sellers. Use promo code: Jungle$15OFF to get $15 off your first purchase. So the insert shows in this article seems out dated and against TOS now? What is the take on Jungle scout side? We go more in-depth on Amazon TOS here, and you can expect us to update once again this year to stay on top of any new changes. Is it against TOS to include a link to my website to register the product for warranty, or a link to download the installation manual? As far as I’ve seen, it’s not. And a lot of sellers use that as a “loophole” to collect customer information. I need to know is sending gifts along with the product without asking customer to review the product in exchange of the gift violating amazon TOS? As long as you don’t explicitly state that’s why you’re sending the gift, it should be fine. I am going to run a test campaign to check how can I increase my product reviews and in that I’m going to send incentives to the customers prior and post review, i was wondering is sending the incentives to customers with the product is violating the TOS? Hi, I know this question has been beat to death, but just looking for your thoughts on a more specific example. I purchased a competitor product because I saw that some of the negative reviews were, “they buy reviews..”. Upon opening the product I saw they had an insert that said, “Like our Products? Get a Free Bottle.” They then directed you to a unique landing page that was there brand, where you had to provide info such as email, shipping, and amazon order number. They would then send you a free product of lesser value via their own website. 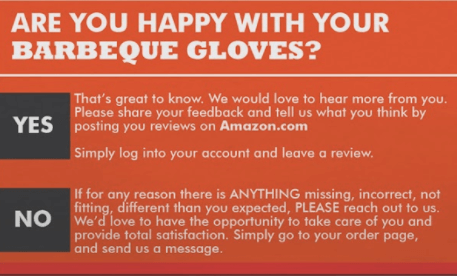 The last page of that process says “Before you get your Free Bottle, Please Share your Experience.” They had a text field for you to enter the review and then a link to take you back to Amazon and post the review. Is this totally against TOS? Or just the last page where they tell you that you can’t get a free bottle until you leave a review? could it be worded differently to not be against TOS? Could you simply separate the page asking for a review from the free product page? Thanks you any insight on this! This article is a treasure trove for information related to product packaging and product inserts. An awesome resource, Greg. Thanks for sharing this. Appreciate your efforts! It was a really useful article. Just a quick question, is it possible to put an insert in the packaging and suggest the customers to follow us on our social media pages like facebook or instagram? is it against TOS? I’m considering using messenger code to help my customers with any issues they have upon opening their package from me. This would essentially take the conversation “off Amazon” in your opinion would this fall inside or outside of the terms of service? I believe if they make the first move, it’s okay. You can also follow up with the customer’s through Amazon’s messenger system using an automated platform like Jump Send. Is this product insert example still within tos? Technically, the insert doesn’t circumvent Amazon traffic so we can check that off. And it doesn’t ask for a “positive” review, just a review. Furthermore, apparently Amazon has no issue with offering coupons to their site for product reviews. The second insert is asking for positive reviews only. I believe that is against TOS. still confused is it allowed to ask for a review on the insert or not? How it should sound to be allowed by amazon? “Thank you again for ordering from us! We would love to hear your feedback and tell us what you think in order to improve our services and help future customers make an informed decision. Simply log into your account to leave a feedback. Is ti against Amazon TOS? Asking for a review is okay, from what I understand, but asking for a positive review or incentivizing for one is not. Does anyone have information on research backing the review rate improving once an insert has been added to the packaging of a product? The products that I sell have decent packaging but I want to know if there’s been research that shows the improvements on a listing once a review is requested. Anyone have insight on social media handles being printed on packaging and/or inserts? Technically I can see how it can be seen as driving traffic away from Amazon, but is it really if we aren’t selling the product through our social media? We were considering having printed on our packaging and inserts @BRANDNAME with our logo and possibly the IG, FB icons as well. What if we are asking for customer feedback or to stay in touch on instagram or facebook? We were also thinking asking them to visit or follow us on social media for regular giveaways that we offer, as well as recipes, tips, etc? The way I understand Amazon’s terms of services is that you can’t drive people away from Amazon in the Amazon listing itself. However, there’s no restriction on the product packaging. Otherwise, this would obviously make things difficult for much larger companies. Thanks for the article. I have packets of instant chicory: 24 separate packets I am sending to FBA in a single box. Each packet is intended to be sold separately. Can I just put 24 inserts into the box and Amazon will know what to do (to include one insert with one packet)? Or do I need to send some kind of instruction to Amazon FBA to make sure they do not just throw away the inserts? I would like not to have to attach/staple inserts to the packets. You need to send in your products exactly packaged how you would like them to be sent to your customer. So in your case each packet of instant chicory needs to include any product add ons or inserts. So you would need to repackage them prior to sending to Amazon’s warehouse. my clients? Or is that something the client does? Any insight would be greatly appreciated! Really, it could work either way. If you end up paying for the domain/web hosting, just be sure to pass along the charges and have a clear contract stating who owns the domain/webspace. In my opinion, it’s better to do that kind of thing for the client. Clients can be kinda–how you say–not tech savvy! Haha, so you don’t want to slow down the process by sending them off to purchase a domain or sign up for hosting. The more holistic you can be in anything you do, whether it’s offering services or selling products on Amazon, the better off you’ll be. Great article! I’m currently looking at options for building my list using an insert with my product to send customers to a landing page. The product is replenishable, so I’m seeing quite a few repeat buyers. As it’s a consumable, I can’t really do a lifetime warranty or anything like that, so thinking of ways to encourage people to sign up. One of the options is to offer the customer a discount off their next Amazon order in return for their email address. Is this is against TOS? Technically, I’m not diverting the customer away from Amazon. I’m offering a code for their next Amazon purchase. It’s a grey area and I haven’t really got a satisfactory answer from seller support. 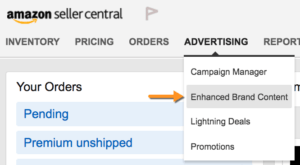 When sending emails to your customers, and if you are using something like Jump Send to automated customer emails, you shouldn’t put in any URLs that will divert people away from Amazon. It is ok to ask for honest, non-incentivized reviews in these emails though, and link to the Amazon feedback/review page. When creating inserts for your actual product, I have always found it to be OK to include a URL on the insert. From what I can tell with Amazon’s TOS it is indeed a grey area. But we have done this with some of our case study products and had no issues, and many other sellers do too. For example, we ran a giveaway for a product to collect emails and put the giveaway URL on the insert. So I think you would be fine to do what you are suggesting. I have heard from some sources that it is allowed to include a registration card inside the FBA product package; the card will offer a free ebook or something if the customer goes to my website and signs up. Is it allowed to give my website in a registration card like this? Thanks !! That’s right you can include a registration card, or “product insert” as we often call it, in with your product. It’s a bit of a grey area as to whether you can put a link to your website on these inserts. I believe Amazon’s TOS states that you shouldn’t put any links in the insert, but then when you consider the fact that pretty much every large electronics product comes with a registration card with a URL I doubt this is ever enforced. We include inserts for our case study products, and put a link to the website on these inserts and haven’t had any issues. One more thing to note, whilst you should never put a link in a follow-up email to a customer, you could also send ebooks as an attachment using a service like Jump Send. Hey Kim, I believe I found my answer to my follow up question re: where “Made in China” should go on the packaging. I think as long as a customer can see it somewhere, it is OK to go anywhere. Great article! I have my inserts ready to go, however, I did not put “made in China” on the insert. Can I put this on the label with the UPC code? Also, I want to confirm, I put my web address on the insert. Is this OK? The made in China label needs to go on the packaging itself I believe. In some circumstances you may need to put it on the label on the product (for example I think textiles have different rules). You shouldn’t need to put made in china on the insert, but on the product packaging itself. Great to hear from you! I am learning so much from you and your million dollar learning experience! You listed two parts of packaging: 1) the label on the product and 2) the insert. Do I need both? I was only planning on doing an insert – no label. If just an insert is OK, does “Made in China” need to be visible on the outside of the packaging? Some products won’t have a label on the product itself, for example our Jungle Stix product. So we would put the “Made in China” note on the outer packaging. Inserts are usually for specific marketing messages (i.e. to seek reviews, repeat purchases or send your customer to a giveaway or website). You don’t need to put where the product is made on an insert so long as you comply with the rules on having it on your packaging for your particular product. Just make sure you do your research before deciding to ensure you are not required to also add a label to the product itself. It can vary by product type and which marketplace you sell in. Thanks. I found this page, https://www.amazon.com/gp/help/customer/display.html/?nodeId=200243250#prep, and I did a bunch of other searches. I don’t believe my product needs any special packaging. However, I’m having trouble finding information on what exactly should go on the label/insert. My product is packaged in a clear box, so I figured just an insert with the product name would be fine. I’m guessing that “Made in China” needs to be seen on the outside of the packaging. Is that correct? Does it matter whether it’s on the front or back of the package? And just to clarify, it should NOT go on the label with the UPC sticker, right? (I should have printed this on the insert but it is too late). Is adding another small label that says, “Made in China” the way to go? Gen says “Encouraging the customer to go to your website, and leave a review on amazon, is against the Terms of Service” but you say “It’s totally cool to put your web address on the insert too – big brands absolutely do this and third party sellers can too”. Which is it? You are right it is a little confusing. As always with Amazon TOS rules, some of them we would never advise going against, whilst others, we know that most FBA sellers bend them a little, and big brands likely don’t adhere to them at all. In the case of product inserts, if you are the brand owner of your product, then there is usually a little leeway that you can leverage. The main thing is that Amazon do not want to see evidence of you diverting customers away from the Amazon shopping platform. We use a website for our Jungle Snugs case study product insert without any issues. The website is not ecommerce and only has information about the product. I believe contact information for customer support is also OK to put in your inserts and packaging. If you imagine buying some Sony headphones, their packaging and product inserts will absolutely have information such as a website, warranty information and so on. In terms of reviews, it’s fine to ask for an honest review from your customers on the Amazon platform, so long as you never incentivize that review by giving a discount or special offer. I’m really enjoying this blog discussion! I’m creating a product that will be packaged into a bubble wrap bag for protection. To highlight my brand, I’m creating a 4×6 inch Thank You Card insert that will have our logo. On the insert, I’m encouraging customers to leave a review. I’m also directing them to my brand’s website if they’re are interested in more products (or to contact us if they have any questions or problems with their order). In terms of Amazon’s policies, is it ok to direct them to our brand’s website? I designed a sticker to go on the removable safety seal for the product, that 1.) Thanks them for leaving a review, so othere can fin us. 2.) Tells them we have information and contests on our Facebook page (no page url given). Would this violate Amazon TOS? You can order your packaging from a third party supplier, however your product supplier likely deals with a variety of packaging for your product, so that may be easiest. So get the template from the supplier and send it off to a package designer. Hope this helps! On the insert card example it seems clear that you are intending to direct all positive reviews to the product page. Also send all potential negative reviews to contact you. My understanding is that this would now violate amazon terms. I don’t think you are supposed to do this in email follow ups so I would think that would include any product inserts. I’m just looking for clarification on this as it’s a great strategy if still within amazon’s rules. Only incentivized reviews are banned, that means offering free product or a discount and requiring a review in return. You are still able to ask paying customers to leave a review if they liked the product, but you should never incentivize this. You can read more this here & here! It depends on the size of your product, but most folks go with a 4” by 6” card. My current product presentation leaves much to be desired. It is just the product, a poly bag and the UPC label slapped on it. I want the experience of receiving and opening my package to be different than what it currently is. I want to differentiate my self and build a brand, not only sell a product. So what I want to understand is, once I designed my package through someone like Erick and Virtuous Graphics, how do I get the package itself done? Who do I contact? And how do I get it to my product manufacturer so he packages my products using this new package design? I would like to understand the logistics behind it all so I can know how to best approach this. The most straight forward route is to ask your manufacturer to package your product using these new designs. If this is how you want to proceed, it may be worth checking their capabilities before you commission any design work. Another option is to have the products packaged in the country of sale once you have imported them. Many sourcing companies offer this service, or you can use a packing and prepping service. The main benefits to this option are that your supply chain is harder to follow (can help prevent getting hijacked), and you can probably get higher quality packaging. But obviously this adds a step into your logistics and will also come at a cost. Hope that helps, thanks for reading! Thank you for letting me know and for providing the details and different options, I have been going nuts over this for the past few days(especially after reading this article lol). It’s Erick from VirtuousGraphics. Most Chinese manufacturers are surprisingly well connected and often have a “go-to” paper supplier; that can do your packaging. Hi Everyone. I am just getting started with my FBA business. I have chosen a product and now need to find packaging and a manufacturer. Do the manufacturers do the packaging there? If I need to find someone separate to do the packaging, does anyone have any suggestions as to who to contact? Also, I have a company name, but do I need to create unique packaging for each product that is related to the product itself and possibly put the company name in smaller print somewhere on the label? Hi there, I was looking all over if it is allowed to do this if you’re using Fulfilment By Amazon. Are you allowed to use the inserts and alter the packaging still or is it not allowed to advertise your own website since Amazon is doing the logistics process? Sure – you’re allowed to do this. 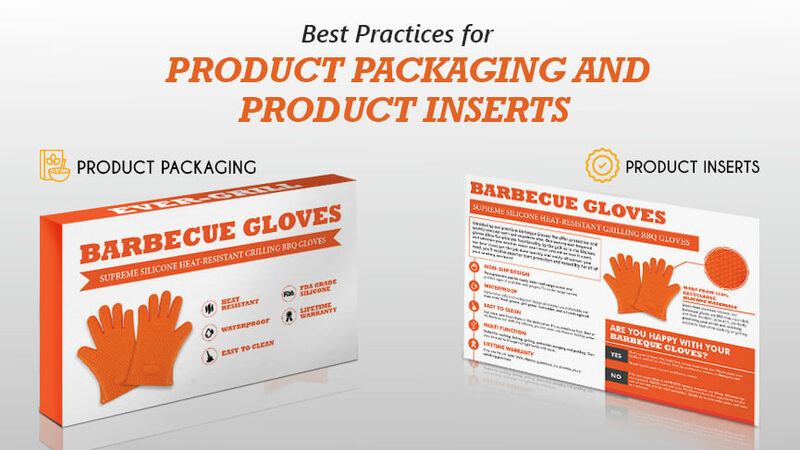 You can present your product packaging and inserts any way you like. For example, imagine if you bought a Sony TV on Amazon, it would still come with a warranty card and the Sony website on the packaging or inserts. If anyone has any questions related to product photography, product packaging; or would just like a free 20min consultation for me to look over on one of their listings. I’d be happy to provide my 2 cents on how to increase their conversion rates through their photos. Thanks for spotting Jonathan – it’s all fixed now!